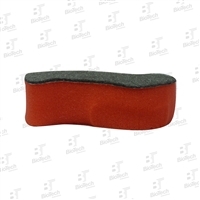 Microfiber Wax Applicator Sponge Blue 5" x 3.75"
Wax Applicator- Black 5" x 3.75"
Microfiber wax applicator pads work for applying wax, sealants, glazes, dressing or your favorite conditioners. Our wax applicator pads do a spectacular job of buffing off waxes and polishes. These fabric pads can be rewashed multiple times for multiple uses. Durable foam encased in soft plush microfiber which gently and evenly applies wax, polish and protectant safely to any surface. Our Foam Finger Mitts are available in three distinct colors and grades, these multi-functional mitts can be used for everything from wheel cleaning, engine cleaning, interior cleaning & detailing and, of course, as a wax applicator. Our Foam Finger Mitts are available in three distinct colors and grades, these multi-functional mitts can be used for everything from wheel cleaning, engine cleaning, interior cleaning & detailing and, of course, as a wax applicator. Our Foam Finger Mitts are available in three distinct colors and grades, these multi-functional mitts can be used for everything from wheel cleaning, engine cleaning, interior cleaning & detailing and, of course, as a wax applicator. Microfiber Wax Applicator Sponge Blue 4" x 6"
BioTech Tire Dressing Applicators make applying tire dressing easier and neater. Hugs the curve of the rubber to apply an even coat, while eliminating runs and drips. This swivel knob applicator tool is designed for both your comfort and convenience.